Field testing demonstrates that Bosse Tools’ ergonomically designed shovels require significantly less muscle effort than traditional shovels. 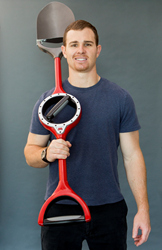 Entrepreneur Stephen Walden, founder of Bosse Tools, is developing a line of ergonomically designed hardware tools. The take-home message was that when the participants used the Bosse shovel, there was substantially less muscle activity [in] the lower back. While helping his parents with yard work one summer, Arizona entrepreneur Stephen Walden wondered how he could prevent the sore, achy muscles that inevitably seemed to follow the rigorous task of digging and shoveling. Determined to find a way to make the work less painful, Walden set out to build a better shovel. Armed with glue and some PVC pipe, he created a prototype of a shovel with a rotating center handle incorporated into its shaft. Unlike standard shovels, which leave the wrists pronated, Walden’s prototype allowed him to keep his hands in front of his body and at the same height, ensuring that the load was evenly distributed between both hands. Realizing that he could apply this design to a whole range of tools, Walden founded Bosse Tools with Arizona State University graduate Aaron Gagleard, who earlier this month earned a bachelor’s degree in business administration from the W. P. Carey School of Business. Together the two are developing a line of ergonomically designed hardware tools that aim to reduce injury and increase productivity by diminishing strain on the back, shoulders and wrists. "What started as a simple idea for a shovel has really taken off into something I never expected,” said Walden, who serves as the company’s president and CEO. “It’s a whole new look for all hardware tools, promoting ergonomics and safety in the workplace." Thanks to a partnership with ASU’s College of Health Solutions, Walden and Gagleard had the opportunity to put Bosse’s shovels to the test during the spring 2014 semester. The two teamed up with Health Solutions faculty members Donna Cataldo and Erin Harper, both kinesiology instructors, and their students in the Biomechanics Lab to compare a traditional shovel to a Bosse shovel from a biomechanical perspective. The partnership allowed Walden and Gagleard to collect data about the efficacy of their product while giving ASU students the opportunity to participate in hands-on field testing with real-life applications. Over a two-week period, the students conducted testing that measured angles of flexion (how much the body bends) of the trunk, knees and wrists while using a traditional shovel, and then while using a Bosse shovel. The students also conducted electromyography (EMG) testing to measure differences in muscle usage between the tools. The test results showed that participants experienced a significant decrease in muscle strain while using a Bosse shovel. Most participants showed positive differences in trunk and knee flexion and a significant increase in grip strength when using the Bosse shovel. In addition, the EMG testing showed that the Bosse shovel provided a significant advantage in arm and back muscle usage, as well as a small advantage in leg muscle usage. Overall, the field testing demonstrated that Bosse shovels reduced muscle effort for digging motions by 32 percent when compared to a standard straight-shaft shovel. Bosse shovels also reduced muscle effort for lifting by 29 percent as compared to the traditional shovel. "I think the take-home message was that when the participants used the Bosse shovel, there was substantially less muscle activity [in] the lower back," Harper said. Though still a young company, Bosse Tools has already garnered national attention. The Bosse shovel was featured on Popular Science’s “10 Best Things” list in the magazine’s February 2014 issue, and stories about the company have appeared in nearly 50 media outlets, including USA Today, Fast Company Design, the Arizona Republic and the Phoenix Business Journal. Capitalizing on the media buzz, in 2013 Walden conducted a highly successful crowdfunding campaign on Kickstarter, raising more than $64,000 for the company. Also in 2013, the company was accepted into the ASU Startup Accelerator, an ASU program that provides services to Arizona-based startups. "Bosse Tools is one of approximately a dozen startups participating in the ASU Startup Accelerator, which supports and guides Arizona-based startup companies as they develop products and services, build a customer base and secure funding," said Mitzi Montoya, vice president and university dean for entrepreneurship and innovation at ASU. "Participating companies benefit from mentorship from experienced entrepreneurs, training and resources designed specifically for startups and opportunities to secure funding from investors." Walden and Gagleard, Phoenix natives who attended Brophy College Preparatory together, agreed that the ASU Startup Accelerator has been crucial to Bosse’s success. The ASU Startup Accelerator is now accepting applications for its next accelerator cycle. Arizona-based ventures in all sectors are encouraged to apply by May 30. The program is open to both ASU and non-ASU applicants, including students, faculty, staff, alumni and community members. Bosse Tools is a startup company that is changing hardware tools through ergonomics, ultimately creating more efficient shovels, rakes, brooms, pitchforks and more. The company is transforming the construction, agriculture and landscaping industries. Bosse Tools has developed and patented an ergonomically efficient design that utilizes a 360-degree rotational center handle for its tools. The Arizona State University College of Health Solutions aims to prepare the next generation of health professionals through a broad set of health degree programs including highly regarded nutrition, exercise and wellness, kinesiology, biomedical informatics, speech and hearing science, and behavioral health programs. CHS equips students to influence healthier lifestyle choices and develop creative interventions to improve the health of people and populations. Arizona State University offers services for Arizona-based companies, including faculty spinouts, alumni ventures and non-ASU startups, through the ASU Startup Accelerator, a joint venture between ASU’s Office of Knowledge Enterprise Development (OKED) and Arizona Technology Enterprises (AzTE).